This intensive online gross anatomy course is designed to prepare students for entry in the field of health professions. 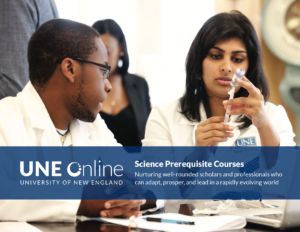 UNE’s online anatomy course provides students with a detailed examination of all structural aspects of the human body with a special emphasis on the anatomy and anatomical relationships significant to common clinical cases. It is presented by regions through online lectures and matching online labs. The course content is also designed to correlate with important clinical problems that students may encounter as practitioners, and additional readings assignments are included in the material to be studied by the students. The students also have the opportunity to further their knowledge of anatomy by using audio and video clips of anatomical structures (Anatomy on the Web) available through our course management system, Blackboard Learn. Working at the pace typical for a four semester hour course, the average student will complete this online anatomy class in approximately 16 weeks. Many students are nontraditional students who have elected an online anatomy course for the sake of flexibility. Since the course is self-paced, you may complete the course in less than 16 weeks. At least one semester of college level biology is strongly suggested to be successful in this course. All prerequisite courses must have been completed successfully within the past seven years. Purchase directly the access code for this software (valid for 6 months) for $30 using a credit card by visiting http://www.dxrgroup.com/product/haune2017/. Once the company receives the payment verification from the credit card company, the access code information will be sent to student by email within 24 hours. This information will include complete instructions on how to login to Human Anatomy Online as well as phone and email access for free technical support.